For years, surveys and academic studies have looked to pull political connections out of consumer decisions, including what it means when certain people buy certain beer. Stereotypically, results have pointed toward conservative-leaning drinkers choosing famous macro brands like Budweiser or Coors, while liberal-minded shoppers are more apt to pick imports or craft. With Election Day tomorrow, this year may be no different in terms of parsing which social cues come from our commercial ones, but through a collection of research, there are interesting inferences that can be made. In a survey from earlier this year, DataQuencher polled 1,500 U.S. adults as a way to get an idea for self-reported party affiliation and drinking habits. High-level results showed what others have in the past: those who identify as conservative drink more macro beer than those who see themselves as liberal (81% to 65% purchase rate) and craft is favored among liberals (59% to 39% purchase rate). In the month leading up to the survey, 42% of conservatives said they bought a craft beer compared to 57% of liberals. But one of the unique things about the American beer drinker is, even if their politics might be connected to broad purchase decisions, the overarching consumer behavior sounds, well, perfectly American. Five years ago, an analysis by investment bank Demeter Group classified U.S. craft beer drinkers as “explorers” with “non-linear taste preferences,” and a 2017 paper by two University of South Carolina researchers took it a step further, intimating that, based on collected studies, U.S. drinkers are something of predisposed shoppers when it comes to seeking out new experiences. These findings could help explain why classifying conservative or liberal drinkers into two camps of either “macro drinker” or “craft drinker” isn’t as simple as coloring them red or blue. As DataQuencher's results show, variety can be important for either when going beyond American adjunct Lager. When it comes to preferred beer styles, four options ranked above 20% in responses from conservatives: Barleywine (21%), Amber Ale (25%), Pilsner (28%), and Pale Ale (33%). Five were listed for liberals, and as might be expected from previous research, at higher rates: Belgian Ales (20%), IPA (22%), Pilsner, (25%), Amber Ale (28%), and Pale Ale (42%). A significant difference in interest among liberals for Porter/Stout (17% vs. conservatives’ 9%) could be rooted in an affinity toward imported beers, of which Guinness and its family of brands are among the best-selling in the country. Liberals noted they purchased the Irish brand with a 5% higher response rate than conservatives as well. However, one unique outlier is with Sours. Just 10% of liberals said they preferred the style, but only 4% of conservatives felt the same way. Cartwright said it wasn't possible to narrow down the reason for it, and sample sizes across the country make it hard to show correlation, but even at a time when breweries across the country are embracing some variation of Sour/Wild/Mixed-Fermentation programs, from quick-turn kettle sours to longterm barrel-aging, some of the country's beloved makers of these styles do come from liberal-leaning states from the Pacific Northwest or Northeast. Even Colorado, home to small producers like Casey Brewing and Blending up to one of the largest Brewers Association-defined craft brewers in New Belgium, has started to skew more progressive in recent years. While these purchase decisions may differ, responses to DataQuencher showed rate of drinking any kind of beer, and specifically drinking more craft beer than a year prior, were essentially the same. Conservatives (28%) showed slightly higher than liberals (23%) for those who said they spent more than $100 on beer monthly, which itself points toward important, underlying themes at play. 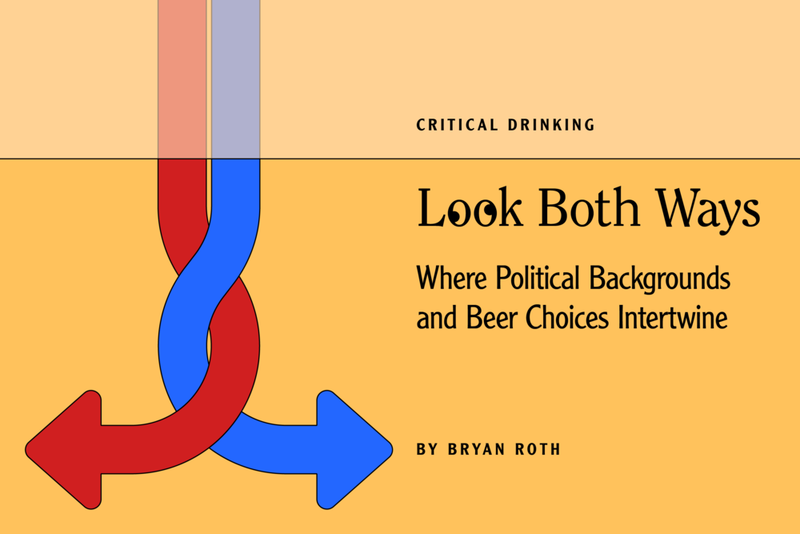 Political identity may have tangential connections to beer purchases, but there are other aspects that should be considered as well. To arrive at some level of understanding of where politics may meet beer, it’s important to consider how or why that identity exists. In a broad sense, attention should be paid to areas of education and income, as it is with so many other aspects of American life. An important place to start is by viewing beer not as the Everyman’s Drink, but craft beer as a luxury good. Price sensitivity among shoppers is real, and where $8 or $9 for a six-pack could seem like a bargain for an enthusiast, it might be a budgeted cap—or even a rare splurge—for most casual consumers. This plays out in the demographics of craft beer buyers that have been reported multiple times over the past decade, always pointing toward income levels easily above national averages. In 2012, for example, faculty from Southern Illinois University found that the average household income of an “average craft brew enthusiast,” was about $75,000. That was about $22,000 higher than the average American household at the time. Then in survey data from 2015-2016, Nielsen found that Millennials—those between 21-34 years old—over indexed significantly as craft beer drinkers when earning more than $100,000 annually. This is the space where connecting dots toward beer choices comes into focus. To get there, we should first look at what would most influence annual income. In simplistic terms, education plays a pivotal role. According to the latest data from the Bureau of Labor Statistics, weekly earnings and unemployment rate change drastically as Americans climb the educational ladder. A person going from less than a high school diploma (6.5% unemployment, $520 weekly) sees their fortunes change by four times over or more by earning a PhD (1.5% unemployment, $1,743 weekly). It’s not an exact science, but this can matter in terms of political affiliation as well. In the most recent data gathered by the Pew Research Center, national surveys showed a clear shift of democratic-leaning preferences over the last 20-plus years. According to findings, 39% of bachelor’s degree recipients self-identified with the Democratic Party and 54% with the Republican Party in 1994. By 2017, those numbers had flipped. It was a long continuation of findings that showed an ongoing correlation between education level and identifying as liberal (more education) and conservative (less education). It’s easy to see how these things could tie back to beer, and ultimately, beer preference. If education begets higher wages, and potentially some aspect of political leanings, the affordability of craft or imports over domestic macro beer is more likely. Cartwright acknowledges the simplicity of playing on social stereotypes, but does note the broad brush strokes that might influence someone who is more conservative politically to display similar behavior in life, where someone seen as liberal might be a more adventurous consumer. In a 2017 study, faculty from the University of South Carolina surveyed a collection of craft beer drinkers to better understand their demographic motivation and backgrounds. Aside from being overwhelmingly white (77.4% of respondents), which itself continues to be an issue the beer industry is addressing, results showed two-thirds of poll takers were highly educated (47.4% undergraduate degree, 19.2% graduate degree) and earned incomes above the national average. The Bureau of Labor Statistics tallied a national average of about $44,700 for an annual salary last year, and survey responses showed 55.5% making $40,000 or more with about a quarter of people earning more than $70,000. With these data points in mind, it may not come as a surprise that the generally highly educated, high-earning craft beer drinkers were found to be “significantly more motivated” to visit a taproom, mostly driven by a “Personal Experience factor.” These drinkers were interested in the variety of new beer, learning more about a brewery, and finding unique beer experiences, all of which may sound traditionally or stereotypically appropriate for more liberal voters. Beer Enthusiasts (39.6% of sample): Younger, with incomes between $30,000 and $90,000, tend to drink craft beer frequently, live in major metro areas. Craft Supporters (25.63% of sample): Generally have a four-year college degree and earn a higher income than the macro loyalists. More likely to regularly drink craft beer. Hipsters (16.09% of sample): Most educated, earn more than most other segments of respondents, more likely to live in major metro areas. Classic Loyalists (18.68% of sample): Less educated, lower incomes than other participants, live in smaller cities, most likely to say they never drink craft beer. Findings weren’t tied to political affiliation, but based on other societal connections, there are some strings worth tugging at. When it comes to the “Classic Loyalist” cohort, who are most likely to say they never drink craft beer, identified respondents skew toward less education. Most people in this category earned a high school diploma or had some college experience without a degree, while the three other categories of drinkers who were more prone to drink craft had their highest marks as bachelor’s degree earners. In all, Hipsters (59.7%), Craft Supporters (55.9%), and Beer Enthusiasts (49.6%) showed stronger responses to having received a bachelor's degree or higher while only a third of Classic Loyalists received the same. Income breakdown looks similar, with most "Classic Loyalists" earning an annual salary below $60,000. More than half of Beer Enthusiasts (57.7%), Craft Supporters (56.5%), and Hipsters (54.6%) reported earnings above $60,000. It would be impossible to draw a direct line between these data points of education and income to what type of beer people drink, but a final finding from this research does connect all these pieces a bit more. When providing taste scores for a selection of six beers (Miller Lite, Budweiser, Corona, Samuel Adams Boston Lager, Oskar Blues Mama’s Little Yella Pils, and Marshall Brewing Old Pavilion Pilsner), preferences did fall in line with what might be stereotypically expected. Classic Loyalists, who on average had lower education and income rates, scored Budweiser and Miller Lite highest. Beer Enthusiasts (Corona and Boston Lager), Craft Supporters (Boston Lager and Old Pavilion Pilsner), and Hipsters (Corona and Boston Lager) all skewed toward craft and imports while having higher education and earnings. The question of whether people considered themselves conservative or liberal wasn’t asked, but putting a variety of research together, this could all suggest that tendencies toward brands or segments plays out to some of what Cartwright discovered with his DataQuencher survey. Conservatives may lean more toward domestic macro brands and liberals may be more adventurous toward craft and imports. From a practical standpoint, does this mean there are business opportunities to be had? Craft beer, long assumed as a bastion for progressive thought and action, seems to have some wiggle room in attracting and winning over customers. After finding her brewery at the center of men’s rights-focused legal action, Ting Su and co-owners at California’s Eagle Rock Brewery now see a purpose to lobby to change state law. Owners of Indiana’s Central State Brewing have been referred to as “brewers, bar owners and social warriors.” North Carolina’s Ponysaurus Brewing has held annual fundraisers for the ACLU. Even Shaun Hill, founder of Hill Farmstead, has been told to “stick to making beer”—a response so common it’s become a joke in and of itself. Indeed, “some breweries have ideals and/or an ethos that drives them to conduct business in a different way,” GBH’s Michael Kiser wrote in a Critical Drinking reflection last year. It all connects to this very particular moment in time when everything can feel politicized. It’s up to companies to determine the cost-benefit analysis, which is more or less determined by a customer base and its potential for growth. If that’s the case, and a craft beer-buying community continues to be sorted through a plurality or majority of consumers who are educated and making disposable incomes, maybe the assumed stereotype just sticks. History may point us toward the pub as a cultural center of thought, discussion, and debate, but in today’s political climate, its politicization might feel a bit more skewed than a neutral space available for heated conversation about Right vs. Left. At the very least, shifting demographics and an evolving market show that craft beer may be more political than we understood it to be. Depending on who we are, of course.